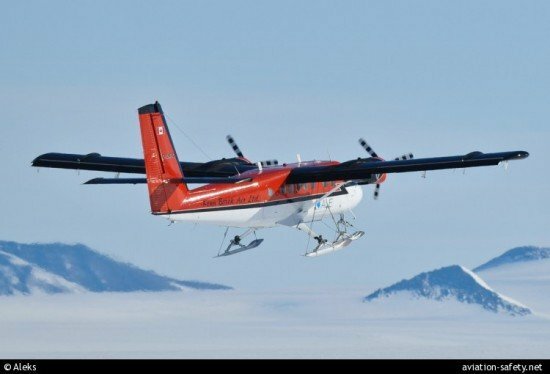 The Transportation Safety Board of Canada (TSB) reported that a recent fatal accident involving a Canadian DHC-6 Twin Otter in Antarctica was a Controlled Flight Into Terrain (CFIT) accident. The TSB says it will conduct a full and independent investigation into the fatal January 2013 crash of a de Havilland DHC-6 Twin Otter operated by Kenn Borek Air Ltd. in Antarctica. The crew of three lost their lives in the accident. On 23 January 2013, the Twin Otter was on a repositioning flight from South Pole Station, Antarctica, to Terra Nova Bay, Antarctica. There had been no radio communication from the aircraft and the flight was considered overdue. An emergency locator transmitter signal was received and search and rescue (SAR) was initiated. Extreme weather conditions hampered the SAR operation, preventing access to the site for two days. Once on site, the SAR team reported the aircraft’s crew did not survive. Adverse weather conditions, the effects of high altitude, unstable snow conditions and the state of the aircraft prevented the recovery of their bodies. The TSB is conducting this investigation because the crew was Canadian, the aircraft was registered and manufactured in Canada, and there may be significant safety findings. “Everything we know at this stage points to a controlled flight into terrain (CFIT) accident, which is an issue on the TSB’s Watchlist,” said Mark Clitsome, Director of Air Investigations. The TSB has examined the aircraft’s cockpit voice recorder (CVR). However, it did not record the accident flight. Investigators will continue to gather and analyze information to determine the causes and contributing factors of the accident.